Hello again! I can’t believe its Fall. How did that happen so quickly? 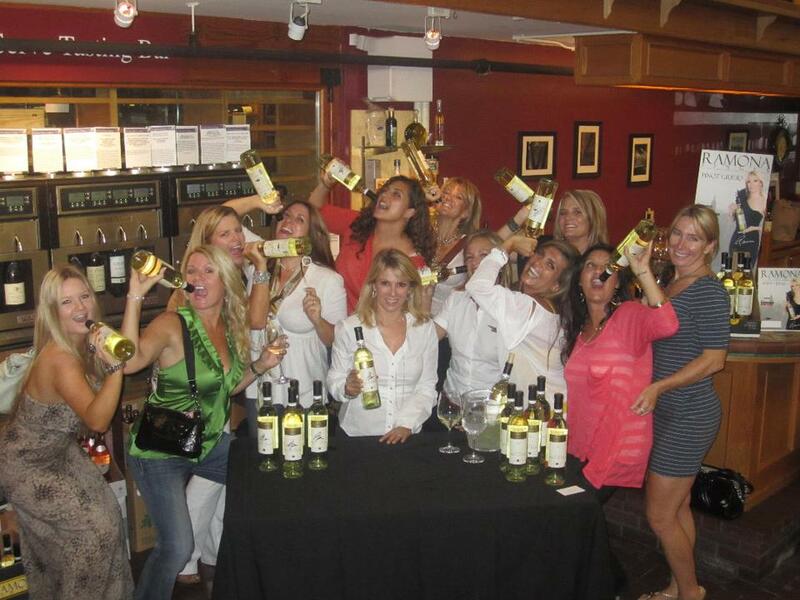 Many of you know that this past Summer I had my first wine tour for Ramona Pinot Grigio and it was a HUGE success! It was such an honor to be able to travel across the country and meet all of my fans. I was welcomed with open arms and got to experience places I may have not been able to otherwise. All of my moments with the fans were special to me. Seeing everyone happy to see me made me happy to see them!!! Ha! But some moments were truly UNFORGETTABLE! Here were some of my favorites! Back in May, I flew into Westborough, MA. Little did I know that TORNADOES were about to hit!!! I was fearful that we would have to cancel the signing and I was torn up about it. Not only did we decide to proceed , but it ended up being one of my best turnouts ever! I couldn’t believe the dedication of my fans to make it out to see me in such awful weather. We had such a great time. It was like our own little tornado party and everyone was safe! I’ll never forget it. It was so great being able to travel all over the East Coast and getting to meet my fans who are relatively close to my home. A special trip was to Newport, RI as Mario attended with me! I was a participant in the Food and Wine Festival but also managed to do two signings. All I can say is, “Wow”. The signings were scheduled last minute and you still all came out! At Vicker’s we did something a little different and had the signing outside. It was a beautiful day and so unique as I had not done that before. If there was any place to choose to do an outdoor signing it was beautiful Newport! I left the East Coast to travel down South to Texas and it is really different…but amazing! I had fans on Facebook and Twitter giving me suggestions of where to go and what to do. You were my own little travel agents! Per all of your suggestions, I went shopping at the Houston Galleria and it was spectacular. While I was trying on clothes at Neiman Marcus, one of the salesgirls brought me a glass of Pinot Grigio without even asking! How funny?!? The Texas signings were unreal. We sold out of all of the cases at both Kroger stores and it was humbling to hear the cheers when I entered. After Texas, I flew to the West coast and did an Orange Country and Los Angeles signing. I met this great group of girls which turned out to be one of my favorite photos! 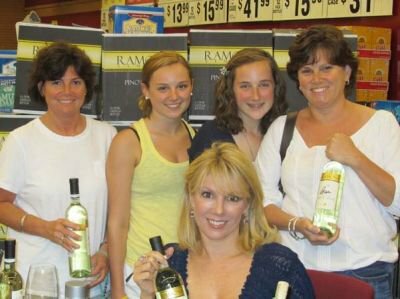 One fan bought a couple of bottles and said, “I told my girlfriends, ‘I’m bringing Ramona with me!’”, as she held up my wine! It’s a gift enough to see all my fans come out to meet me but someone of you actually make things for me! I have them displayed in my home. These two stood out. 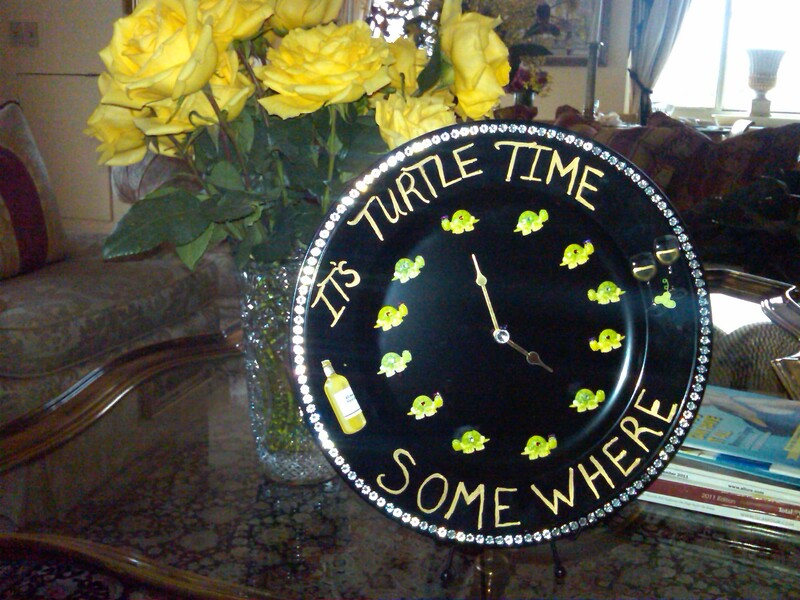 A picture board and a Turtle Time clock that I keep in my living room! Besides finishing up filming and concluding my tour this summer, my fans that I did not get to meet posted some very insightful and smart things on my Facebook and Twitter page. Melissa Worley-Cox recommended something that I still use to this day- a “Gratitude Journal”. At the end of your day, write down 5 things that you are grateful for. Nothing negative or upsetting! ONLY the positive should go in the journal and then once completed you will have such a peaceful sleep and you will be left with a good feeling beyond compare! Trust me, this works!!!! My fans and supporters are always on my list as things I am most grateful for. Thanks again! I’m excited to have a great Fall, start filming again and keep traveling to meet more and more of you! In light of the ten year anniversary of 9/11, I have been asked to share my story of that day. This tenth year anniversary is so very important. We as a country survived the most vicious attack. The day it happened in NYC was something I hope no one ever has to experience in the USA again. Only now, can I share the trauma of that day. Here is my experience of 9/11 as a NYer. It was a gorgeous day in New York. It was sunny and warm with clear skies. I even remember what I was wearing; a skirt with a shirt and very high heeled opened shoes with no stockings. Mario was away on business in Italy for the week. He usually would take Avery to school in the mornings. That morning I took Avery, who was six years old, to school in a car service, dropped her off and continued to my office on Broadway and 39th Street. In Times Square, on Broadway, is a huge TV screen; literally100 ft high. I looked at it and I saw to my disbelief the World Trade Center being hit by a plane. I remember thinking to myself, how could a plane make a mistake of crashing into a building? Did the pilot have a heart attack? Was there a malfunction with the plane that they couldn’t maneuver? I then knew for certain that we were under attack. I felt like I was in a movie. This can’t be happening. This can’t be real. But, it was. I went back to my office, got my things together and told everyone to leave. My strongest thought then was that I have to get Avery. I must get to Avery as fast as I can. I walked out of my office building and I saw clouds of smoke rising high from Wall Street. It was so eerie, scary and threatening. What was going on? Are we all going to die? Will I get to Avery in time? Oh how I wish Mario was here! There were no cabs and I was not taking the subway. Maybe poisonous gas would be down there. Who knew what was going on? The Air Force planes were buzzing over my head. This is not the U.S. This is not happening to my country. This has to be a bad dream. I walked over 60 blocks in 5 inch heels. It was finally 1:30 pm when I reached Avery’s school on East 91st street and Fifth Ave. My feet were raw but I only wanted to get Avery. I was blind with my mission. The school obviously knew at this time what was going on. But, because our children were so young, they did not convey anything to them. So many moms and dads were outside the school to get their children. The school convinced us to wait another hour to receive our children at the normal dismissal time. They did not want these young children to panic or be upset. Panic? I am freaking out myself! But, okay. They made sense. What would one hour mean? So, I waited. My good girlfriend’s ex-husband was there. His daughter was best friends with Avery. I asked him if he could speak to both girls together about what was going on as I was at a loss and really did not know what I should tell Avery. I realize now that I was in shock and did not trust myself to say the right thing to my child of 6 years, my most precious person in the world, my Avery. How could I explain to her something I was not even understanding myself!!? David told me what he was planning to say to our girls. To this day I don’t remember what he said. I just remember it was the right thing to say to 6 year old children. I brought Avery home and I wanted to leave the city ASAP to our country house. That afternoon, they closed all the roads and bridges that led outside the city. I couldn’t leave the city. I was trapped. What if the fumes from Wall Street contained toxic elements? What if these fumes could hurt Avery’s lungs or worse, kill her?!? My thoughts were only for Avery, not myself. I needed to get her out of the city ASAP. They opened the bridges and roads in the AM and I left the city so fast with her. I invited my girlfriend to join us with her two children and she did. One was Avery’s best friend. I remember so vividly pulling up to our home in Southampton and such a feeling of huge relief came over me. I am safe here. We are all safe here. It was as if I was in another world. It took me over sixth months to get over 9/11. I could not sleep well. I did not feel safe. Every time I heard a siren, I would panic. Here we are, ten years later, and the wound still feels fresh. But, as I watch the ceremony on the television of the new memorial I feel that we are finally rebuilding. We are united and forever connected. My thoughts and prayers go out to all of those who lost loved ones. My thanks go out to all of our heroes who saved us on that day and protect us every day since. All I can say now is, God bless America, the best country in the world that I am so proud to be part of.